Raise the intensity of your workout with these Monster iSport Intensity in-ear Bluetooth headphones. They allow you to wirelessly connect to your compatible device up to 30ft so you don't need to worry about cords or carrying around your phone. 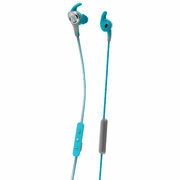 Sweatproof design with water-resistant ear clips ensure they stay put no matter how vigorous your workout.